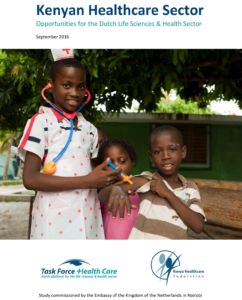 Throughout the years KHF has built a strong track-record as mission-driven, program implementation partner for development partners, NGOs and other players that wanted to have the voice private health sector represented in their programs. Furthermore, KHF’s large network of Kenyan and East African leading healthcare businesses, organizations and networks has proven to position the Federation as the ideal partner to facilitate international delegation trips or individual business entries in the Kenyan (and East African) market(s). For every engagement, KHF assembles a team with the most appropriate experience and expertise. The Afya Elimu fund (AEF) is a public- private partnership (PPP) initiative aimed at increasing access to both pre-service & in- service training fees for the needy middle level college students geared towards responding to existing gaps in capacity development of the health workforce in Kenya and unmet needs for certain cadres of health workers. This initiative is a joint venture between the Higher Education Loans Board (HELB), the USAID funded FUNZOKenya project, KHF and the Ministry of Health (MOH). The fund attracts a joint participation of the Private Financial & non- financial sectors, Faith based Organization (FBOs), Ministry of Education (MOE), The National Treasury and the Vision 2030. HELB administers the fund as an affordable loan product managed by a loan management oversight committee comprising of representatives of the key stakeholders. The ultimate aim of this initiative is to create a self-sustaining revolving fund from which students will continue access financial assistance to enroll into health sector related courses. It is KHF’s responsibility to mobilize AEF – funds financing from the private sector. The Private Sector Health Partnership in Kenya – (PSHP Kenya) is a private sector collective action initiative in support of the Global Strategy for Women’s, Children’s and Adolescents’ health and Kenya’s Beyond Zero Campaign. The health and well-being of over 3.5 million women, new-borns, children, adolescents and family members in Mandera, Migori, Marsabit, Wajir, Isiolo and Lamu are planned to improve through this initiative by 2020. The 6 counties have a combined population of approximately 10% of the national population but contribute close to 50% of the country’s maternal deaths. Currently the PSHP Kenya collaboration is signed between the National Government Ministry of Health and County Governments of Wajir, Isiolo, Lamu, Mandera, Migori and Marsabit, and private sector companies Safaricom, Philips, MSD, Huawei and GSK (GlaxoSmithKline). The PSHP Kenya welcomes other private players on board who can make a significant difference in the maternal health status in the 6 counties. PSHP Kenya is supported by a secretariat established by KHF and United Nations Population Fund (UNFPA) in Kenya. This report was commissioned by the Embassy of the Kingdom of the Netherlands (EKN) in Nairobi, Kenya. It is produced by Kenya Healthcare Federation (KHF) and Task Force Health Care (TFHC) and sets out a high level analysis of the healthcare sector in Kenya, business opportunities for organisations active within the Dutch Life Sciences & Health sector, and recommendations for the EKN on how to increase the involvement of the Netherlands in the Kenyan Healthcare sector. Kenya is one of the 6 countries of the East Africa Community (EAC) and is widely regarded as the business hub for East Africa. The economy is growing, the workforce is strong and capable, the population young and educated, and English being one of the national languages (besides Kiswahili). Together with the economy, Kenya’s middle class (44.9% of total population) and the demand for quality healthcare is on the rise. Kenya has an estimated population of 46 million with an average population growth of 1 million per year, with a median age of 19 years and a high (although declining) fertility rate of 4.4 children per woman. The country is experiencing a population flow from the rural areas to the city centres and currently about 25% of all Kenyans live in an urban setting. Kenya’s burden of disease has historically been mostly focused on communicable diseases. However, recent research shows a large and fast increase in the prevalence of non-communicable diseases such as cancers and cardiovascular diseases. This is mainly attributed to life style changes of Kenyans. In 2010, Kenya adopted a new constitution which created a devolved government which established 47 counties which are governed by their own governments and have a relatively high degree of autonomy when it comes to budget allocations – including for healthcare. Copyright © 2018 | Kenya Healthcare Federation | All rights reserved.